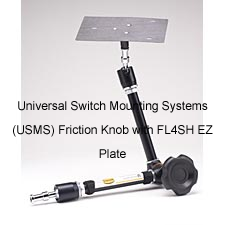 This kit includes the Universal Mounting System Friction Knob, Super Clamp, and the plate of your choice (unless otherwise noted). Universal Mounting Plate - The Universal Mounting Plate is a replacement for the Cradle Plate #10045000, Large Triangular Plate #100LTMP, Small Triangular #100STMP, Large Rectangular #100LRMP, Small Rectangular #100SRMP, Relax/Mini Relax #66160, EZ Mount Plate #10040800, and Small Circular Plate #100SCMP. Grasp Mini Joy Stick Plate - Connects your Grasp Mini Joy Stick to our mounting arms. Mini Cup, Trigger Plate - Connects your Mini Cup or Trigger switch to our mounting arms. Velcro included. Micro Light Plate - Connects your Micro Light switch to any of our mounting arms. Pneumatic Plate - Connects your Pneumatic switch to our mounting arms.